So this is what she’s been doing lately. “I’m going to make my OWN books.” And she tapes some tiny pages together and draws away. They don’t often make a lot of sense, as in this charming tale about Chewbacca and Han Solo, and how Han lost his pants while Chewie made shadow puppets on the wall. Since she can’t write yet, she makes up the dialogue and asks me to write the words out for her. This one is an Adventure Time story. She doesn’t watch the show (it’s a little too aggressive for her) but we’ve read a few of the comics and she LOVES the characters. Sure they don’t make a lot of sense, but they crack her junk UP. She gets a big kick out of them. I am asked to read these tales at bedtime, and they’re often built sideways, forward, backward, upsidedown. And that’s just the way she wants it. And although I don’t always know what the heck is going on, she is incredibly proud of them, and that’s cool. I started thinking about what a great practice it is for a kid who hasn’t got writing skills down yet to work on telling a story in pictures. She is fascinated by word bubbles and thought bubbles. She once asked me when she woke up, “when you came in, did you see my dream bubble?” She has learned from her own observations that shaky lines mean movement, swirly lines mean “dizzy,” and is JUST starting to understand what some of the punctuation marks do (she cracks up when I read sentences how they would sound with different punctuation). When she was younger, she didn’t “get” sequential art–she saw multiples of the same person in each frame, and couldn’t figure out why there were so many of them. Are they sisters? Are they twins? Why are there so MANY of them? It didn’t make sense. 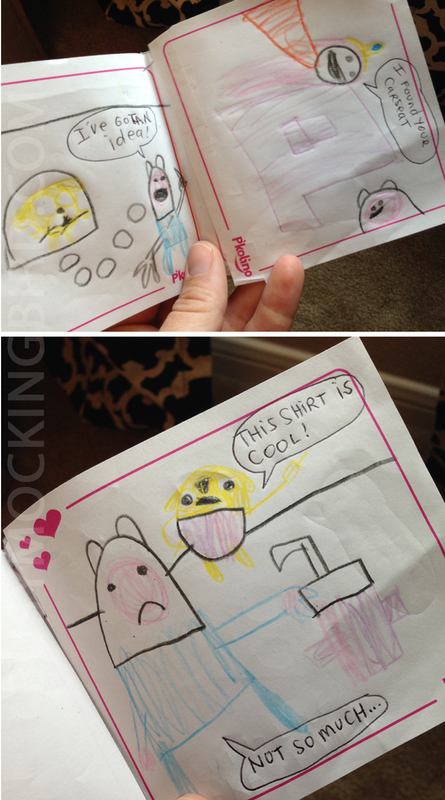 But having read a few more little comics, she’s getting the hang of it, and it’s awesome to see. My friend made her a Hobbes doll for her 5th birthday, and sent a Calvin & Hobbes book to go along with it, and she LOVES them. Most of the words are over her head, but what cracked her up the most? Calvin playing in the toilet. Of course. Awhile back, a small publishing company called Toon Books contacted us. They specialize in comic stories for kids, said they loved our doodles, and asked if they could share some of their books with us. You want to send us cool books? Uh…yes please! She said that “Maya Makes a Mess” reminded her of our “Beautiful Messes” post. 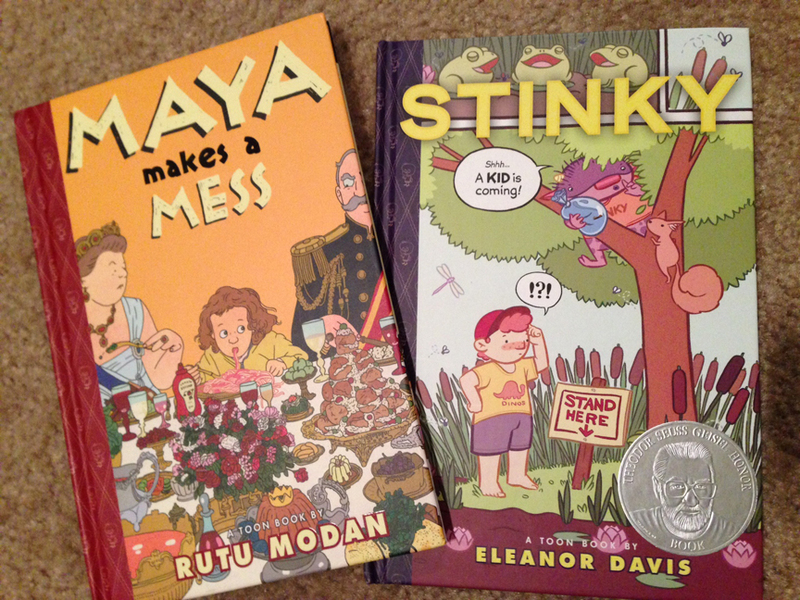 Myla is at an age where messes and dirt and disgusting things are comedy GOLD, so both of these books cracked her up. The sequential/comic aspect of books like these has sparked her creativity, and really allowed us to talk about what a story is actually trying to tell you when the frame doesn’t have any words in it. And what it means when a character says “!?! ?” (like on the cover of “Stinky“), and what it means when there’s not a word bubble, but instead, a rectangle that says something like, “Meanwhile, in the swamp…” It’s given us a chance to talk about how to make a character say something without saying words. Plus, again: messes and goo and disgusting things=kid COMEDY GOLD! But while gross things amuse her, she’s SUPER sensitive about some things. She doesn’t like wild action, or “bad guys,” or crazy adventures where things blow up and people get hurt or trapped. This makes moviegoing a little difficult (there is nearly ALWAYS a bad guy in movies!). Awhile back, we finally saw the movie Totoro and both LOVED it, people told us about Ponyo and Arietty, and of course, Spirited Away. All of them were wonderful, and she loved things about all of them. But Spirited Away was one of those that left us BOTH scratching our heads. It was one of the first that she’d ask me a question about it and I’d have to say, “you know…I really don’t KNOW…” But we both agreed: the characters were AWESOME. 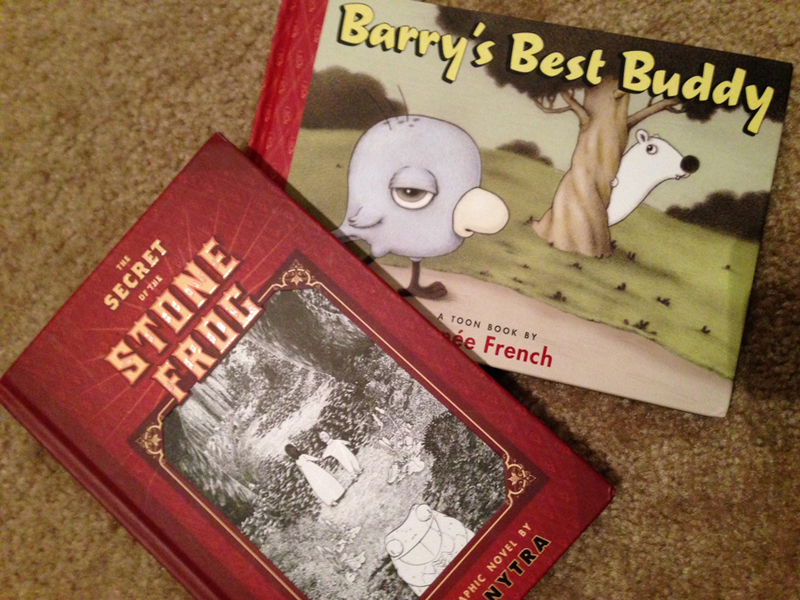 So, the person from Toon Books sent us “The Secret of the Stone Frog,” saying it might be a little too advanced for her, but that we’d both enjoy the artwork. She was right: the artwork was BEAUTIFUL! (Actually, the artwork was great in all of the books they sent!) But since we had so recently seen Spirited Away, this was was similarly strange, and Myla was amped about the strange characters and unusual adventures. And the best part: NOTHING BAD OR SCARY HAPPENED. So, as I said, sequential stories confused Myla early on. But now, they’re a source of inspiration–to be able to tell a story as you might see it in a show, but on paper. She’s seen the characters say things like “Ooof!” and “Ow!” and “ZZZZZ,” all of which have stuck with her. And I’ve seen them reflected back in her artwork, and in her little handmade books. So what stories are you or your kids telling? Homed in on your comment that it’s a great idea for kids to draw their stories in pictures; on a recent author visit, one of the boys who doesn’t write so well told us the most INCREDIBLE story by drawing simple line pics…His vocab was amazing in the physical telling, but he just didn’t have the ability to capture that on paper. Yeah, everyone learns so differently. The bad thing is, they don’t really know that, so they’ll sometimes compare themselves to others and feel badly about their skills…when actually, they might just not have found their “medium” yet. Great to hear! Priceless: the look of intense concentration in the first picture. Oh, I LOVE her stories! 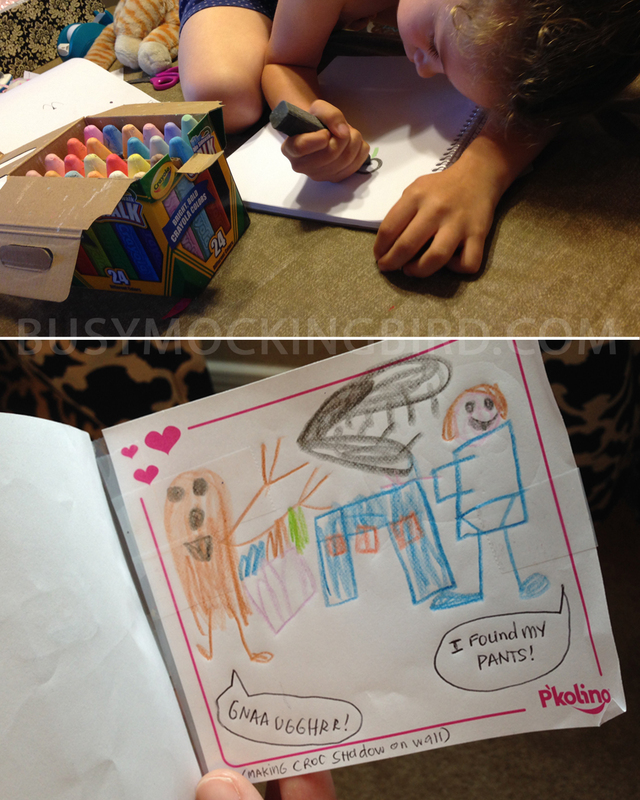 My six-year-old is extremely imaginative, but in practical ways, so I don’t get too many fanciful stories out of him. My four-year-old, however, has been making up “movie stories” for over a year now. Lately it’s been all about Scary Sea Dragon and deep sea treasure seeker Liam. And my two-year-old has decided that she is Queen Elsa Super Daniel Penguin.